It’s time for our next movie promo. Together with Grand Cinemas and The Examiner Newspaper, Blackrooke are giving away a stack of family passes to see an advanced screening of the new animated family movie THE BOOK OF LIFE. 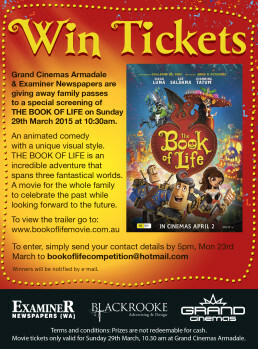 For your chance to get along, send your contact details to bookoflifecompetition@hotmail.com by 5pm, Monday 23 March.